Holy moly. 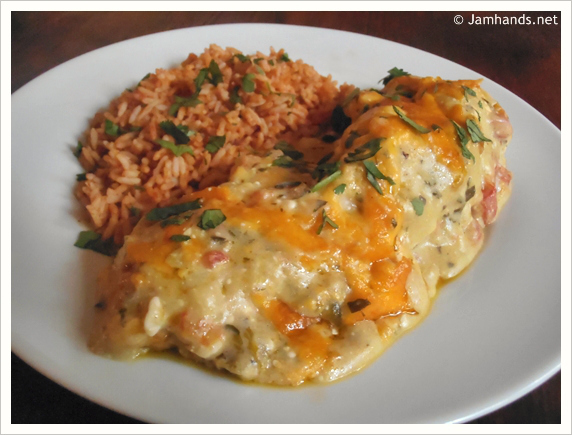 So these Creamy Cheesy Chicken Enchiladas from the Sunflower Supper Club are pretty amazing. Definitely the best I've ever made. While I like the traditional red enchilada sauce, these are much, much better. A green enchilada sauce is mixed with spicy tomatoes and cream cheese to make a tasty sauce. It is a little heavy on the cilantro flavor so if you are not a fan of that, cut it way back. I happen to love it so this was perfect. Delicious enough to be served at a restaurant for sure. I served it with a quick Mexican rice and it was devoured pretty quickly. Enjoy! One note: The original recipe didn't state what size baking dish to use, although it looks like a 9"x13" from the picture. However, using the heaping 1/2 cup per serving per tortilla, I only filled up an extra deep 9"x9" baking dish and it filled only 6 tortillas. Use your best judgement. You can make it go farther by using less filling per tortilla, or by using smaller tortillas as well. 1. Melt the 3 tablespoons butter in a Dutch Oven over medium heat. Add the onion and saute for about 3-4 minutes until soft. Add the garlic and saute another minute or two, until fragrant. Add flour and mix; continue cooking for 2 minutes. 2. Add the rotel, green chile enchilada sauce, cumin and the ground red pepper. Bring to a boil, reduce heat and simmer for 10 minutes. Remove from heat and mix in the cream cheese and cilantro. Stir until the cream cheese is melted. 3. Place the cooked and diced chicken in a medium sized bowl and add 1 cup (4 ounces) shredded cheese and 1 cup cream cheese enchilada sauce. Mix well. 4. Put 1 1/2 cups of the cream cheese enchilada sauce in the bottom of a large lightly greased pyrex dish. 5. Wrap tortillas in a damp paper towel and microwave for about 30-45 seconds, to soften. 6. Divide the chicken mixture evenly between the tortillas (about a heaping 1/2 cup) and roll up. Place seam side down in the pyrex dish. 7. Cover with the remaining cream cheese enchilada sauce and top with the remaining shredded cheese. 8. Bake in a 350 degree oven for about 35- 40 minutes until hot and bubbly. Garnish with additional minced fresh cilantro if desired. Recipe from the Sunflower Supper Club. Linking up to the parties found here. Thanks :) It tasted amazing! Hi Ali! Thanks so much for sharing my Chicken Enchiladas. I have had the best time poking around your delicious looking blog. We are your newest followers and I'd love for you to stop back by and link up something to our Weekend Potluck. Have a terrific week! Thank you Kathryn. I will be sure to check it out! This do look very, very yummy!!!! Right up my alley! Thank you :) It was very yummy. Love your enchiladas! 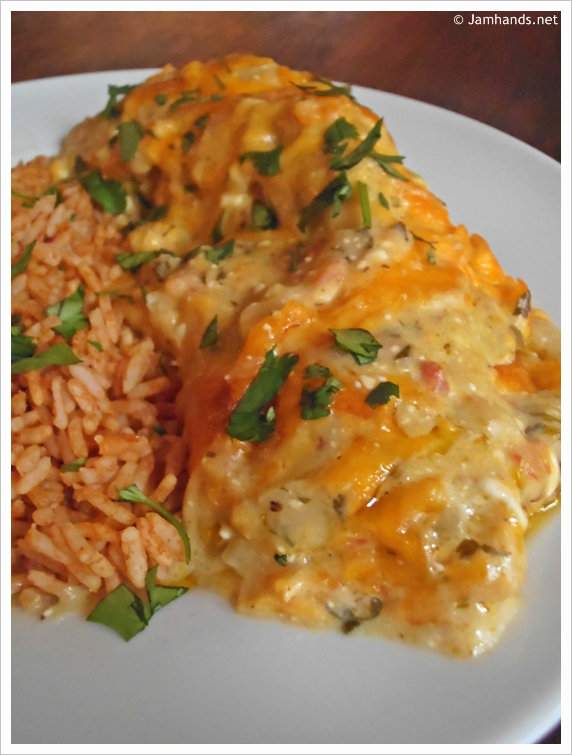 Chicken enchiladas with green chile sauce is a favourite here! I must ask though, what is Rotel? I've never heard of this ingredient before. Hi Amber! Here is a link for Rotel. It is tomatoes and chilies. These look like great enchiladas. I have a link party on Wednesdays, and I would love it if you would link this post. It is called Wednesdays Adorned From Above Link Party. YUM - that looks so good, may have to get added to the menu plan! Thanks Suzanne! I hope you try it out. Looks delicious. Do you think it would work with con tortillas, my hubby is GF. Oh yum! That does look sooo tasty!